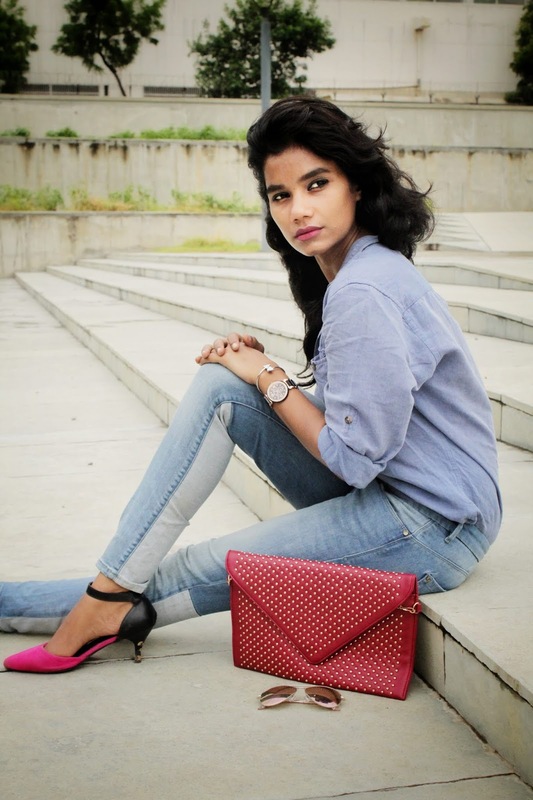 Denim is such which most of us love, so since we love it, can we double it? I say “yes”, as it does double the hotness. I have been quite a huge fan of denim on denim trend for a long time, when you double your denim expertise it’s a sight to behold. As 90s kids we own this trend, as this trend belongs to the 90s. When double denim done right, it makes up for one of the best looks. When you go denim on denim another major style is covered, which is the monochrome style, which again I adore. Wearing denim on denim if done right can be as dressy as wearing white or black. In today’s post, I have put together three of my go-to denim on denim looks. This is the classic shirt and jeans look, which we can never go wrong with and something that will never go out of style. In this look one thing to keep in mind is, if the shirt is oversized then make sure the jeans are not loose, so that there is a perfect balance in the fit of the entire look. 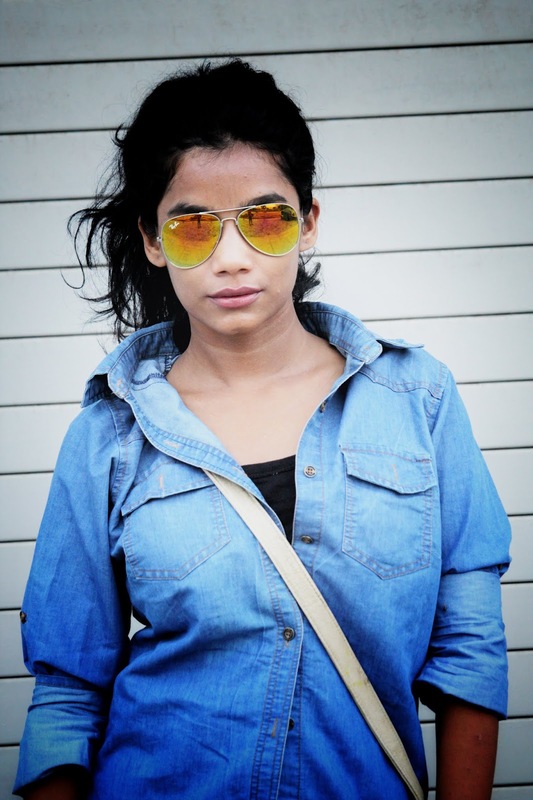 For this look I wore a dual toned jeans with an oversized denim shirt tucked in as I was aiming for a polished look. 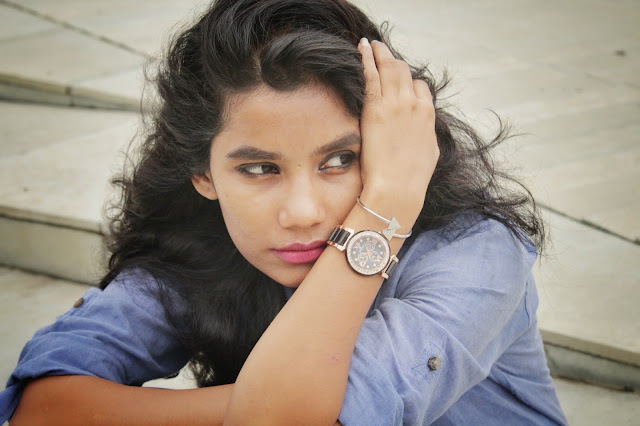 In case you are looking for a messy casual look you don’t need to tuck in the shirt, you can open few buttons from the top and push the shirt behind or you can wear it as a one shoulder shirt. Cute is just a perfect word for this look. 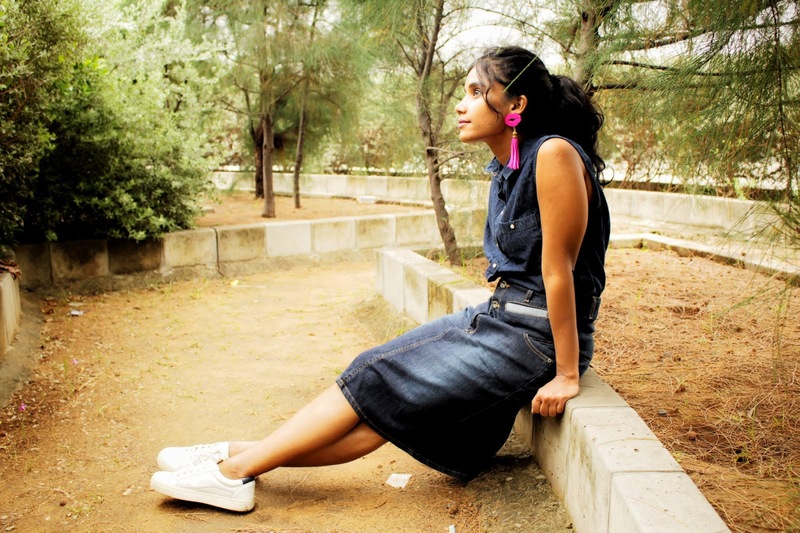 Denim shirt tucked in a skirt, white sneakers and those statement making earrings rounded off this look. When you double the denim, make sure all the pieces have a similar vibe. The best thing about co-ordinating separates is that you get more than one for the value of less. This look is my most worn look and also my favourite. It’s a striking street chic all denim look. It screams street style and an off duty look. It starts with a light shade and then transition with a dark colour. I wore black crop top with the skirt. Black and the different shades of blue are perfectly marrying each other. Those were my go to denim looks, do let me know yours. Fabulous outfit! I still haven't tried denim on denim and it's on my to do list. Hope that you had a wonderful Christmas :) It was a busy but fun one here as I hosted it this year for my family. We are still eating lots of delicious leftovers, haha! I'm starting to get back to blogging after my little break for a few days. You've showcased the idea so well here, Priya!! I like how you showed more than one way to style it, and they all look great! I love denim and your 3 denim total look are so beautiful. Happy new year! Fantastic denim on denim outfits! I am also a 90ties kid so I get what you mean. Denim on denim is a trend that comes naturally to us. The first outfit is fabulous. The second one is very chic and the third one is so cute. I do like how you styled a long shirt with a denim skirt in the third outfit. You look fantastic. Happy 2019 beautiful!!!! Ah yes denim on denim is so fun! And it is easy to accessorize. You can really play it up like you did. Loving the pops of pink, so pretty. 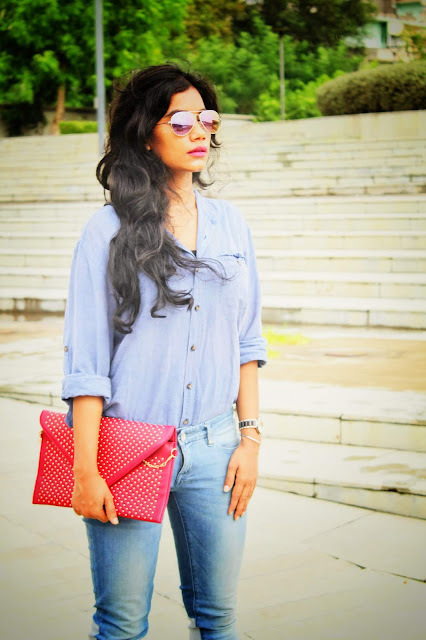 Just love denim on denim and all of these looks are perfect! I really love that white wash panel on the back of your denim jeans in the first outfit! 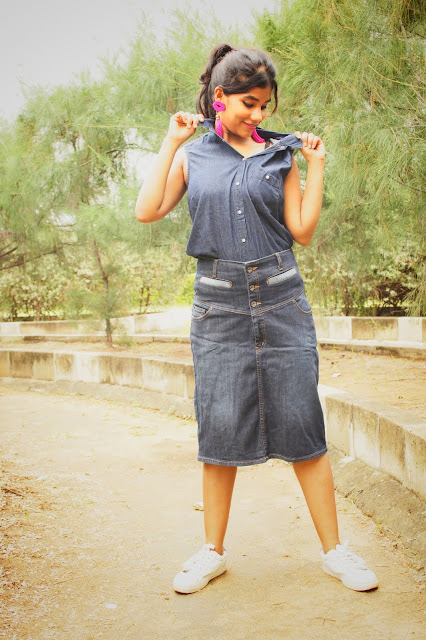 Denim on denim is a classic and one of my go to looks....happy new year dear. Ohh yes got to love denim. 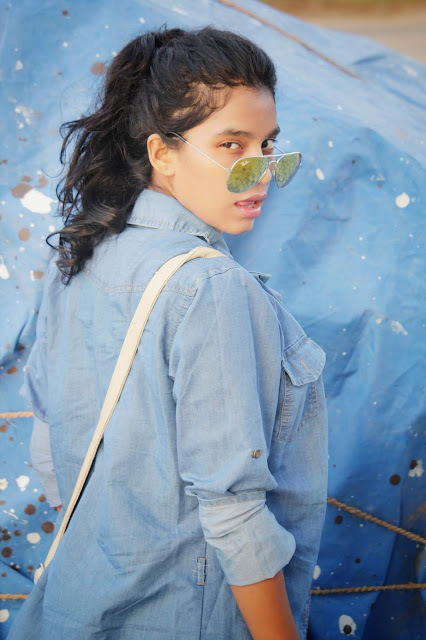 I love wearing a full on denim look, so chic and easy to wear. I love denim on denim, one of my favorite combinations ever! Love both denim on denim looks! The first one is my fave. I love a good all-denim outfit! Looking gorg, babe! I love a great denim on denim look too. Those shoes in the first pic are great. Gotta love denim! Forever timeless and you look wonderful. I love your shoes in the 1st outfit!! Loving all the denim on denim looks Priya. Happy New Year gorgeous!!! I love your first look! I love jeans and I liked every outfit you posted, have a great day! Very nice and stylish looks, dear! 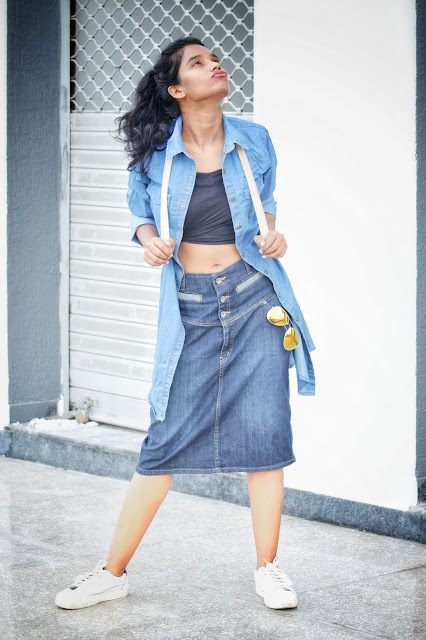 My fav is the 1st, double denim is always a great choice! I love these denim outfits, dear! Thanks for sharing! Very nice looks. I love denim.